Adenosine to inosine (A-to-I) RNA editing is a post-transcriptional process by which adenosines are selectively converted to inosines in double-stranded RNA (dsRNA) substrates. A highly conserved group of enzymes, the adenosine deaminase acting on RNA (ADAR) family, mediates this reaction. All ADARs share a common domain architecture consisting of a variable number of amino-terminal dsRNA binding domains (dsRBDs) and a carboxy-terminal catalytic deaminase domain. ADAR family members are highly expressed in the metazoan nervous system, where these enzymes predominantly localize to the neuronal nucleus. Once in the nucleus, ADARs participate in the modification of specific adenosines in pre-mRNAs of proteins involved in electrical and chemical neurotransmission, including pre-synaptic release machineries, and voltage- and ligand-gated ion channels. Most RNA editing sites in these nervous system targets result in non-synonymous codon changes in functionally important, usually conserved, residues and RNA editing deficiencies in various model organisms bear out a crucial role for ADARs in nervous system function. Mutation or deletion of ADAR genes results in striking phenotypes, including seizure episodes, extreme uncoordination, and neurodegeneration. Not only does the process of RNA editing alter important nervous system peptides, but ADARs also regulate gene expression through modification of dsRNA substrates that enter the RNA interference (RNAi) pathway and may then act at the chromatin level. Here, we present a review on the current knowledge regarding the ADAR protein family, including evolutionary history, key structural features, localization, function and mechanism. Adenosine deaminases acting on RNA (ADARs) are enzymes that catalyze the chemical conversion of adenosines to inosines in double-stranded RNA (dsRNA) substrates. Because the properties of inosine mimic those of guanosine (inosine will form two hydrogen bonds with cytosine, for example), inosine is recognized as guanosine by the translational cellular machinery . Adenosine-to-inosine (A-to-I) RNA 'editing,' therefore, effectively changes the primary sequence of RNA targets. These enzymes, discovered over 25 years ago , are highly conserved in metazoa , although the number of genes and isoforms varies between species. Mammalian genomes encode three ADARs: ADAR1 and ADAR2, which are catalytically active , and ADAR3, which is thought to be catalytically inactive . The Caenorhabditis elegans genome encodes two genes, CeADR1 and CeADR2 , while only a single adar locus is present in the Drosophila genome  (Figure 1a). In addition, the squid  and hydra (RA Reenan, unpublished results) genomes each encode a single adar locus, while the chicken and zebrafish genomes encode two and four adar genes, respectively . Furthermore, ADAR genes are also present in the genomes of both sea urchin and sea anemone, suggesting an early origin of RNA editing enzymes in metazoan evolution . In contrast, ADAR genes do not appear to be present in fungal, plant and yeast genomes . The ADAR family protein. (a) Domain architecture of metazoan ADARs. The deaminase domain is depicted in purple, while the dsRBMs are shown in orange and Z-DNA binding domains, unique to human ADAR1, are presented in green. The human genome contains three ADAR genes (hADAR1 to 3). That of the squid Loligo pealeii contains an ADAR2-like gene (sqADAR2) that produces variants (a and b) through alternative splicing. C. elegans contains two genes (ceADAR1 and 2), while the genome of D. melanogaster encodes only one (dADAR), an enzyme homologous to hADAR2. Although the dsRBMs found in the Hydra magnapapillata genome are highly divergent, five such motifs are recognizable in hmADAR, the only identified gene in this species. Human and Drosophila ADAT architectures are included (red), as these enzymes are believed to be ancestral to present-day ADARs. (b) Cladogram based on ADAR catalytic domain sequences. MacVector was used to generate a relatedness tree based on the protein sequences of ADAR catalytic domains from different species. C. elegans ADAR2 is absent due to difficulty aligning the catalytic domain. Note that human and Drosophila ADATs (red) cluster as the outgroup. Interestingly, although prokaryotic genomes do not contain ADAR genes, they do encode a transfer RNA (tRNA) adenosine deaminase (TadA), which modifies specific tRNAs . Eukaryotic orthologs of this RNA editing enzyme, adenosine deaminases acting on tRNAs (ADATs), are also conserved in metazoa and catalyze the deamination of specific adenosines to inosines at or adjacent to the tRNA anticodon . Sequence homology between the catalytic domains of ADARs and ADATs suggests a model in which tRNA modifying enzymes are ancestral to ADARs (Figure 1b). In this model, a duplicate ADAT gene acquired one or more dsRNA binding domains that allowed the protein to recognize and bind dsRNAs. This novel gene is thought to have conferred selective advantage due to repair of detrimental genomic mutations by A-to-I modifications at the mRNA level . ADAR enzymes share a common domain architecture consisting of a variable number of amino-terminal dsRNA binding domains (dsRBDs) and a carboxy-terminal catalytic deaminase domain  (Figure 1a). Human ADARs possess two or three dsRBDs, while the C. elegans enzymes contain one or two. The single Drosophila ADAR contains two dsRBDs, similar to the mammalian ADAR2. In squid two ADAR enzymes are generated via splicing from a single adar locus: while isoform 2a contains two dsRBDs, the inclusion of an alternative exon leads to the generation of an ADAR enzyme (2b) containing an additional dsRBD, which confers higher enzymatic activity in vitro . Interestingly, recent evidence suggests that this extra dsRBD of the squid ADAR isoform 2b is required for appropriate RNA editing in the high salt conditions of a marine environment , suggesting a link between the regulation of the RNA editing process and changes in the physical environment. In agreement with this, additional evidence suggests that RNA editing may be regulated by temperature [13, 14]. Finally, the Hydra magnapapillata genome encodes an ADAR enzyme that contains five identifiable dsRBDs (Figure 1a; RA Reenan, unpublished results). A single domain feature is unique to human ADAR1, which contains two Z-DNA binding domains  that recognize the left-handed helical variant of DNA in a sequence-independent manner . In fact, the Z-DNA binding domain was first identified in human ADAR1 (hADAR1) , and prior to this discovery Z-DNA was thought to be non-functional . Interestingly, binding of hADAR1 to Z-DNA restricts the nucleic acid from adopting another DNA conformation . This restriction is thought to play an important role in gene expression, as the binding of ADAR to Z-DNA around a reporter gene promoter results in increased levels of transcription . However, more work is needed in this area to understand the specific function of the unique Z-DNA binding domain in hADAR1. The crystal structure of the human ADAR2 deaminase domain (Figure 2) suggests that a catalytic center forms in the enzyme active site: a glutamic acid residue (E396) forms hydrogen bonds with a water molecule, while a histidine (H394) and two cysteine residues (C451 and C516) coordinate a zinc ion that activates the water molecule for nucleophilic attack . Buried in the catalytic core, an inositol hexakisphosphate (IP6) molecule stabilizes multiple arginine and lysine residues and is also required for catalytic activity . 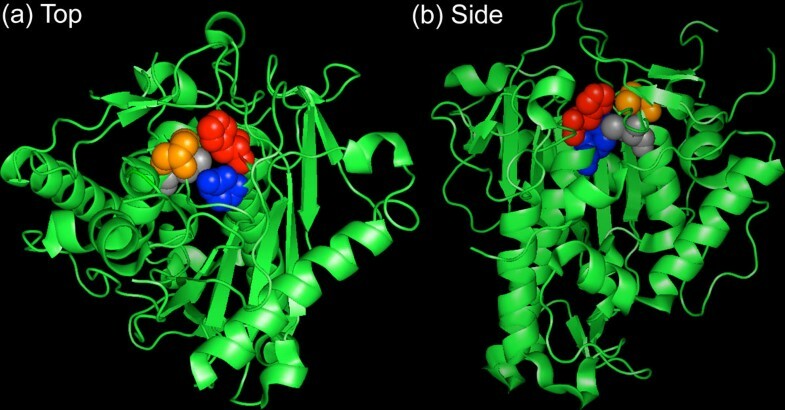 Crystal structure of the human ADAR2 deaminase domain shown from the top (a) and side (b). The catalytic core is formed between H394 (red), E396 (blue), C451 (orange) and C516 (gray). The core also includes a water molecule, zinc ion and IP6 molecule (not shown). The three mammalian Adar genes give rise to four known isoforms: ADAR1p150, ADAR1p110, ADAR2 and ADAR3. ADAR1 variants and ADAR2 are expressed in many tissues, whereas the ADAR3 protein is only present in the brain [5, 21, 22]. ADAR3 is thought to be catalytically inactive , but it is possible that it competes with ADAR1 and -2 for RNA binding substrates, altering the editing profile through that mechanism. Alternative promoter usage within the ADAR1 transcript generates a full length (ADAR1p150) and an amino-terminally truncated (ADAR1p110) isoform , both of which contain three dsRNA-binding domains and the deaminase domain. The ADAR1 isoforms differ in their cellular distributions: ADAR1p110 exclusively localizes to the nucleus [24, 25], while ADAR1p150 shuttles in and out of the nucleus, although it accumulates in the cytoplasm [23, 26]. The cytoplasmic localization of ADAR1p150 suggests that a select class of dsRNAs could be targeted outside the nucleus as mature mRNAs. However, cytoplasmic localization of other ADARs is unusual. In general, mammalian ADARs are strongly localized to the nucleus. More specifically, ADAR1p110 and ADAR2 are present in the nucleolus and this localization is dependent on functional dsRBDs [24, 25]. ADAR nucleolar localization may be mediated by dsRNAs generated from ribosomal RNAs (rRNAs) and small nucleolar RNAs (snoRNAs), both of which are concentrated within the nucleolus. To date there is no evidence that ADAR modification of rRNAs or snoRNAs occurs; thus, the significance of ADAR nucleolar localization remains enigmatic. However, translocation of ADAR2 from the nucleolus to the nucleoplasm upon expression induction of a known editing target resulted broadly in higher editing levels in pre-mRNA substrates . Therefore, the nucleolar localization of ADARs may represent a mechanism for regulating editing of pre-mRNAs through enzyme sequestration. In Drosophila, Jepson et al. examined the complete expression pattern and cellular distribution of dADAR using a genetically engineered allele containing an HA epitope tag inserted into the endogenous locus. Visualization of dADAR-HA revealed that Drosophila ADAR is predominately expressed in the nervous system. Furthermore, both transgenic dADAR specifically expressed in the salivary glands of third instar larvae, as well as endogenous tagged dADAR, localize within the nucleus and accumulate within the nucleolus  (Figure 3a,b), consistent with observations regarding mammalian ADARs. Overview of ADAR localization and function. (a) Transgenic HA-tagged ADAR (green) localizes within the nuclear envelope (lamin, red) and more specifically to the nucleolus (fibrillarin, red) in Drosophila salivary gland cells. (b) Endogenous HA-tagged ADAR (green) localizes to the Drosophila neuronal nucleus and colocalizes with the nucleolus, distinguished by the red fibrillarin signal (arrowheads). (c) RNA structures that direct editing. The complex pseudoknot of Drosophila synaptotagmin-I is presented in contrast with the simple hairpin of mammalian GluR-2, both specific editing targets. Exons are represented in blue, introns in black. Adenosines targeted by ADAR are red. (d) Editing affects splicing. Mammalian ADAR2 auto-edits its own transcript, creating a novel splice site (red), which results in the inclusion of 47 nucleotides (yellow) and a frameshift in the coding sequence. In the mammalian GluR-2 transcript, editing at both the Q/R site in exon 11 and an intronic 'hotspot' (red) is required for efficient removal of the downstream intron. Editing of the R/G site (red) reduces efficacy of downstream splicing and favors an alternative final exon configuration (yellow). (e) Editing can interfere with siRNA and microRNA production and targeting. Perfectly duplex siRNA precursors are targets for hyper-editing by ADARs. Editing may result in improper Dicer processing and fewer functional siRNAs, or edited siRNAs. Primary (pri) microRNAs, imperfect duplexes, may be targets for specific editing, resulting in mature miRNAs toward alternative mRNA targets. Electropherograms derived from edited cDNAs include mixed A/G peaks representative of transcript editing (Figure 4a). The comparison of cDNA libraries to genomic sequences led to the surprising discovery of a multitude of new RNA editing sites in various genetic models. In Drosophila, Hoopengardner et al. uncovered an intriguing phylogenetic signature of A-to-I RNA editing using a comparative genomic approach. This led to the identification of approximately 50 new editing sites in 16 different genes, all of which encode proteins involved in electrical and chemical neurotransmission. However, to further understand the biological significance of RNA editing a more complete analysis of the inosinomes of multiple organisms is required. The consequences of specific versus non-specific editing. (a) Short, imperfect duplexes, such as Drosophila synaptotagmin-I, are specifically edited leading to transcript and peptide recoding. (b) Long, perfect dsRNA substrates, including those formed by nearby transposons in opposite orientation (green), are hyper-edited, leading to fewer or edited siRNAs. This may alter gene expression through RISC (yellow) targeting, but evidence also links the RNAi pathway to chromatin regulation. The recent advent of deep sequencing technologies has allowed the identification of new RNA editing sites in several genetic organisms and provided us with a clearer picture regarding the regulation, editing patterns, and biological significance of RNA editing . For example, a recent study in Drosophila using deep sequencing technology led to the identification of 972 novel editing sites in 561 genes involved, not only in neurotransmission, but in a wide range of other functions, suggesting that RNA editing events in coding regions are more widespread than previously anticipated . While editing in Drosophila often appears to result in genomic recoding, a recent deep sequencing study in humans reported that the majority of RNA editing occurs in non-coding regions of the transcriptome . Thus, the use of nascent deep sequencing technologies to study RNA editing has already uncovered diverse ADAR substrates and revealed variation within RNA editing systems across a broad range of organisms. The structural diversity of potential RNA substrates results in a wide repertoire of ADAR targets [3, 32]. ADARs recognize short, imperfect RNA duplexes and deaminate select adenosines (specific RNA editing) . In contrast, promiscuous editing of multiple adenosines, also known as 'hyper-editing', usually occurs in long, perfectly paired RNA duplexes. Imperfectly duplex double-stranded editing substrates are sometimes generated within exonic sequences when the nascent transcript folds, creating simple hairpins [33–36]. Yet, more often intronic sequences with extensive complementarity to upstream or downstream exons containing the targeted adenosine(s) can pair with the exonic sequence to form structurally diverse RNA duplexes. These intronic cis elements, also known as editing site complementary sequences (ECSs), can form simple exon-intron hairpin structures [34, 37–40] or more complex RNA secondary structures such as pseudoknots  (Figure 3c). The majority of ECS-mediated editing substrates contain mismatches, bulges and loops. It is thought that the presence of such structural imperfections directs ADARs to specific locations on the RNA duplex without the requirement of primary sequence recognition. However, upon binding, ADARs do exhibit sequence preferences for modifying select adenosines over others. In vitro studies using synthetic editing substrates revealed that ADAR enzymes preferentially target adenosines neighbored by a 5' uridine, while adenosines with a 5' guanosine neighbor are exceedingly rare [42, 43]. In addition, adenosines found in mismatches with cytosines are edited more often when compared to other adenosines . Specific RNA editing often leads to transcript recoding. Because inosine shares the base pairing properties of guanosine, the translational machinery interprets edited adenosines as guanosine, altering the triplet codon, which can result in amino acid substitutions in protein products. More than half the triplet codons in the genetic code could in theory be reassigned through RNA editing . Due to the degeneracy of the genetic code, RNA editing can cause both silent and non-synonymous amino acid substitutions. However, statistically, RNA editing in Drosophila predominantly results in non-synonymous changes  and thus favors the diversification of protein products. While the functional consequences of most specific recoding events are currently unknown, myriad studies in diverse model organisms indicate that specific RNA editing of certain mRNAs can result in profound changes in protein function [33, 46–49]. General transcript analysis reveals RNA editing sites as mixed A/G peaks in electropherograms, but this representation conceals specific transcript-to-transcript variability. Several studies focused on transcripts with multiple editing sites, which showed that completely edited and unedited mRNA transcripts co-exist within cells. For example, examination of editing patterns in the Drosophila potassium channel, shaker (sh), revealed that unedited and edited transcripts co-exist and their relative proportions change in a spatial, temporal and sexually dimorphic manner . In addition, the Drosophila paralytic (para) sodium channel transcript, edited at three nearby sites in exon 19, is contemporarily present in both completely edited and unedited forms, as well as in the many combinations of edited isoforms at the three sites . Adenosines targeted for editing are disproportionately localized near splice junctions in the pre-mRNA . Therefore, during formation of a dsRNA ADAR substrate, intronic cis-acting sequences can form RNA duplexes encompassing splicing sites and potentially obscuring them from the splicing machinery (Figure 3c). Furthermore, through modification of select adenosines, ADARs can create or eliminate splicing sites, broadly affecting later splicing of the transcript. Similar to the translational machinery, the spliceosome interprets inosine as guanosine, and therefore, a canonical GU 5' splice site and AG 3' acceptor site can be created via the deamination of AU (IU = GU) and AA (AI = AG), respectively . Correspondingly, RNA editing can destroy a canonical AG 3' splice site (IG = GG) . For example, mammalian ADAR2 edits its own transcript (auto-editing), leading to the generation of a novel 3' splice site. Auto-editing results in the inclusion of 47 nucleotides  (Figure 3d), causing a frameshift and leading to a decrease in overall ADAR2 protein . The regulation of Adar2 transcript splicing via auto-editing represents a negative regulatory feedback mechanism to modulate ADAR2 protein levels since inhibition of auto-editing in vivo increases ADAR2 expression and editing at many target adenosines in the transcriptome . 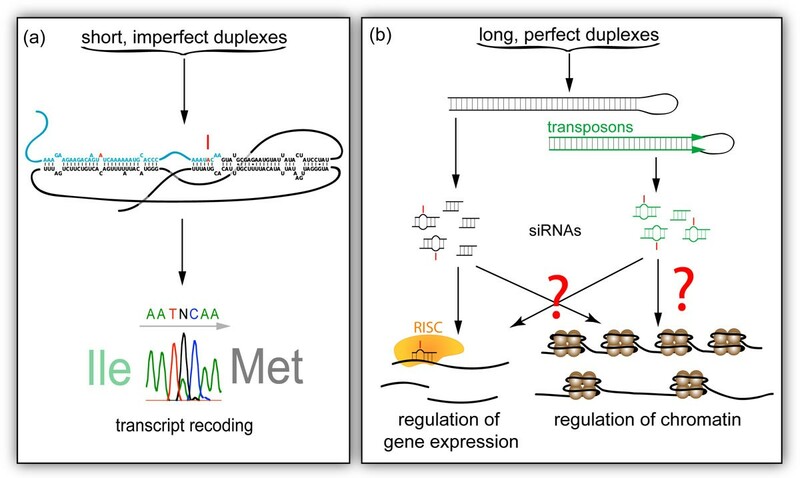 Yet even editing at sites that do not encode splicing signals can affect splicing. The mammalian GluR-2 transcript, for example, is edited at two non-synonymous sites: the 'Q/R' and 'R/G' sites, named for the residue changes resulting from editing. When the Q/R site, located in exon 11, as well as a downstream intronic 'hot spot,' is edited, splicing is enhanced between exons 11 and 12 (Figure 3d). In the same transcript, the R/G site is located just one nucleotide from the boundary between exon 13 and the downstream intron (Figure 3c). When this site is edited, splicing favors inclusion of exon 15 over that of exon 14 (Figure 3d). The mechanism of how these particular editing sites affect splicing of the GluR-2 transcript is still unknown . Deamination of adenosines found in non-coding regions influences the biogenesis and target recognition of small interfering RNAs (siRNAs) involved in the RNA interference (RNAi) pathway . The biogenesis of siRNAs requires processing of long dsRNA precursors into 21- to 23-nucleotide RNA duplexes, a task carried out by the Dicer class of RNase III-like ribonuclease enzymes . The mature siRNAs generated by Dicer are unwound for the incorporation of a single-stranded RNA ('guide' RNA) into the RNA-induced silencing complex (RISC). Ultimately, the targeting of RISC by the small guide RNA initiates transcriptional and post-transcriptional sequence-specific silencing . Growing evidence supports the interaction between the editing and RNAi pathways. Since the RNA editing and RNAi pathways both involve dsRNAs, editing is theoretically capable of antagonizing the RNAi pathway at two levels. First, adenosine deamination could alter the perfectly duplex structure of dsRNA substrates, leading to poor Dicer processing and thus decreased siRNA concentrations (Figure 3e). Second, RNA editing of siRNAs may prevent base pairing of the RISC with the original mRNA targets, inhibiting the cleavage step of RNAi . Similarly, editing would change the target of an siRNA if ADAR edits the primary sequence of the guide RNA. siRNA biogenesis is progressively inhibited with increased RNA editing in vitro [57, 58]; however, the in vivo functional consequences of the antagonism between editing and RNAi pathways are still unclear and this remains an open avenue for future ADAR research. Similar to the siRNA pathway, micro RNAs (miRNAs) are highly conserved, genomically encoded 20- to 25-nucleotide RNAs that mediate gene silencing and regulate diverse cellular processes, including development, differentiation, and apoptosis [59, 60]. This class of small interfering RNAs is encoded within non-coding regions of the genome and form hairpin primary miRNA structures (pri-miRNAs), which are extensively processed to generate the mature miRNA. In their double-stranded state, these pri-miRNAs can serve as ADAR substrates (Figure 3e). Indeed, several miRNA precursors undergo A-to-I RNA editing at specific adenosines [61, 62]. Editing of these precursors can inhibit further cleavage and processing , as well as regulation of gene expression. A single edited adenosine within the six-nucleotide targeting 'seed' region of the miRNA is sufficient to redirect silencing to a new target  (Figure 3e). In addition, A-to-I RNA editing is highly enriched at 3' UTRs within miRNA targets in multiple mouse tissues, which might represent a regulatory role for RNA editing in translation . More importantly, RNA editing can inhibit or initiate miRNA/target interactions via modification at important positions where complementarity is required for appropriate miRNA targeting. In primates, non-specific A-to-I editing predominantly occurs in Alu elements [66, 67] localized within the introns of transcribed genes. Alu transposable elements are mobile, short DNA sequences that constitute 10% of the human genome . When nearby Alus are inserted into the genome in reverse orientation, their sequences may form a near perfect long duplex when transcribed, an ideal substrate for hyper ADAR modification. This non-specific editing is believed to diversify the transcriptome and some have even proposed that this contributed to increased brain function in primates . Editing in these widespread genomic elements can result in the posttranscriptional creation of splicing signals, leading to exonization and transcript diversification . For example, A-to-I editing in the human nuclear prelamin A recognition factor generates a novel 3' splice site and alters splicing enhancer signals . Furthermore, ADAR1 small RNA-mediated knockdown in human cells results in the aberrant exonization of Alu elements in a seryl-tRNA synthetase gene, suggesting that RNA editing could globally regulate Alu exonization events within the transcriptome . Alu editing is also necessary for the tissue-specific inclusion of Alu elements in coding sequences . The binding of an ADAR enzyme to an RNA substrate requires direct contact between the dsRBDs and dsRNA substrates . Nuclear magnetic resonance and X-ray crystallography studies reveal that the binding of double-stranded RNA binding proteins (dsRBPs) in general to dsRNA relies less on sequence than on structure [73–75]. Because dsRNA adopts an A-helical structure, which contains a deep and narrow major groove, dsRNA binding proteins are thought to recognize substrates through indirect readout and RNA structure . Consistent with the binding properties of other dsRBPs, ADARs can bind to any dsRNA without sequence specificity . It has been widely assumed in the field that the dsRBDs of ADAR enzymes confer structural specificity during specific editing, determining which substrates are targeted and which adenosines are edited. Yet recent in vitro work by Eggington et al. suggests that mammalian ADAR1 and ADAR2 are both able to edit when lacking amino-terminal dsRBDs. Not only do these truncated enzymes effectively edit in vitro, but they are also able to selectively deaminate the same adenosines targeted by the full-length enzyme, although to different levels. The dsRBDs may function as RNA 'anchors' , but these data suggest that ADAR specificity is predominantly conferred, not by dsRBDs, but by the deaminase domain itself . However, experiments in an in vivo setting are required for the biological relevance of this observation to be understood. Generation of ADAR deficiencies in genetic model systems highlights an important role for these enzymes in the appropriate functioning of the nervous system. In the last decade several studies have provided a link between RNA editing and multiple nervous system disorders. Abnormal RNA editing is associated with suicidal depression, schizophrenia, epilepsy and amyotrophic lateral sclerosis (ALS) . Furthermore, genetic studies suggest that several mutations in the human ADAR1 gene are associated with dyschromatosis symmetrica hereditaria (DSH) , a rare autosomal skin pigmentation disorder, and Aicardi-Goutières syndrome (AGS) , an early-onset encephalopathy that often results in severe and permanent neurological damage. Thus, a better mechanistic and functional understanding of the ADAR protein family will shed light into therapeutic strategies regarding these human diseases. ADARs modify specific adenosines to inosines in short imperfect dsRNA templates, a well-characterized role that usually leads to recoding of transcripts and peptides (Figure 4a). In contrast, ADAR modification of long, perfect duplexes results in the deamination of up to 50% of the adenosines [83–85] affecting siRNA biogenesis and activity (Figure 4b). Although much progress has been achieved in ADAR biology over the past two decades, the consequences of such promiscuous RNA editing, especially in vivo, are not well understood. Several lines of evidence indicate that promiscuous editing by ADARs antagonizes RNAi-mediated gene silencing [32, 86]. 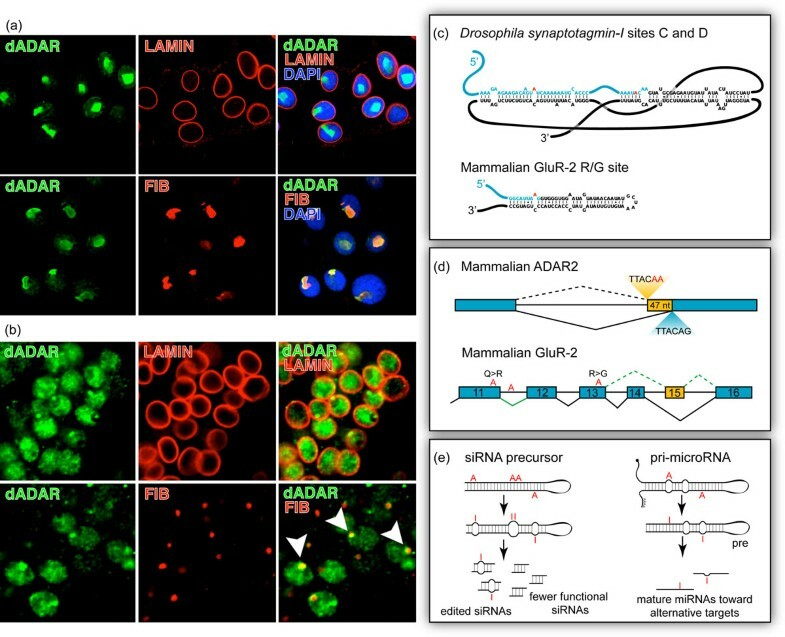 Editing of endogenous siRNAs in Drosophila  suggests that ADARs interact with endogenous RNAi pathways, which are involved in somatic defense against transposable elements [87–90] and in the regulation of chromatin states  (Figure 4b). The consequences, however, of editing/RNAi interactions and the resulting effects on both gene expression and chromatin regulation remain enigmatic. Future studies should aim in deciphering the in vivo consequences of such interactions, as this avenue highlights a more global role for ADARs regarding the broad regulation of neuronal transcriptomes. It was originally proposed that RNA editing evolved to correct detrimental genomic mutations. Although some specific editing sites in the Shab potassium channel are widely conserved across insect species that represent more than 300 million years of independent evolution, other less-conserved sites are genomically encoded in the orthologous genes of species as divergent as squid and insects . These authors also made the striking observation that over half of the editing sites in the squid Kv1 channel transcript are genomically encoded in other species, data that point to a function of editing as a higher order fix for genomic mutations. However, while editing often occurs in highly invariant exonic regions, it appears to preferentially target non-conserved positions, suggesting that diversity at these locations is so important that it is achieved through both genomic mutation and RNA editing. Yang et al. suggest that RNA editing performs two functions: to diversify the proteome by generating novel non-genomically encoded proteins, as well as to safeguard important sites of conservation. Indeed, this dual function is consistent with years of observation that include a few editing sites that are genomically encoded in orthologs  as well as myriad unique non-silent editing sites that do not exist in paralogs or appear to restore an ancestral sequence. Yet the majority of editing sites appear to be non-restorative and therefore it is now widely accepted in the field that the primary role of RNA editing is to increase the diversity of transcripts produced from the more invariant genome, thereby increasing protein repertoire. But what is the functional consequence of increased proteome diversity? RNA editing is most functional within nervous systems and generates novel ion channel properties [33, 94–96]; thus, it is not surprising that mutations in the adar locus lead to defects in complex behaviors in adult Drosophila [14, 27]. In addition, employing a reporter gene for editing activity expressed in the Drosophila nervous system, Jepson et al. demonstrated that patterns of neuronal RNA editing differ between individuals, implicating the ADAR protein family as a driving force for individual-to-individual variation on both a cellular and organismal scale. Furthermore, manipulation of the firing properties of a single neuron affects global organismal behavior [98, 99]. Thus, it is not a stretch to suggest that ADAR, through the various pathways discussed above, could represent a molecular mechanism for generating variation within a population of cells, resulting in neuronal plasticity and affecting behavior. Yiannis A Savva, Leila E Rieder contributed equally to this work. The authors thank James EC Jepson for image contributions.